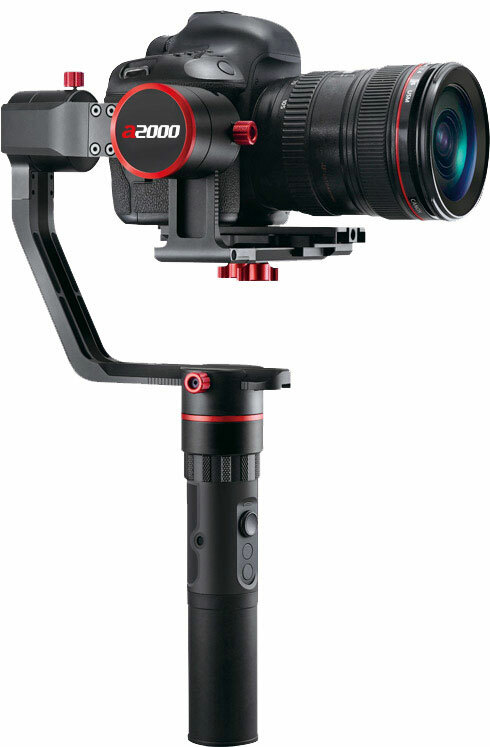 a series 3-axis stabilizer provides perfect solution for steady footages and photos while shooting. Enable everyone to be professional photographer. Applied of damping adjustment arm slider, provide better experience for balancing. The payload range is 250-2500g, motor can adapt itself automatically to work with different weight, no need for parameter setting. Can be perfectly compatible with SONY A7 series/ Panasonic GH4, GH5/ Canon 5D series and the assemblies of another popular cameras & lens, even, it can be compatible with A7+24-70GM. Please refer the sheet of compatible cameras for a2000. 1.7KG loading weight & convenient balance adjustment solution make it compatible with more cameras. 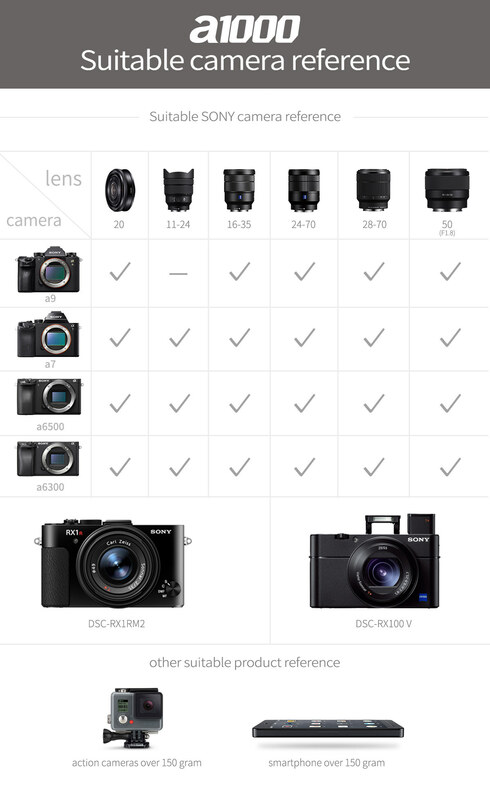 Please refer the sheet of compatible cameras for a1000. Benifits from the new optimization algorithm,a1000 adopts 45° elevation design at rolling axis, not only guarantee the stability,also, insure the viewfinder screen will not be covered by rolling axis.Thus, users can accurately compose the pictures without external monitor. Rolling motor of a1000 is designed to be slant. Thus, the screen of the camera will not be sheltered by rolling motor again, and makes photography easier. The design of dismountable main body and handle gives more possibilities of accessory extension in future. And it is easy to shift from single handheld model to 2 handheld model, can satisfy different needs. Integration of joystick and control button on handle brings better user experience. Users can shift the holding gestures between standing holding, inverted holding, frontal holding, reversed holding, high position holding and low position holding easily as they like. The flat bottom make a1000 stand at any place without holder. Time-lapse photography function can “compress” time, help users to shoot amazing videos containing the beauties of time change, which can’t be caught by human eyes. Auto-rotation function and automatic shutter function of a series make dynamic time-lapse photography easier. Shutter cable within the product package is used to connect camera and gimbal. This cable can control the shutter button, also, can do setting for automatic shooting, time-lapse photography through APP Feiyu ON. Innovative and high performance chips make the gimbal work perfectly. The torque of the motor is stronger.New optimization algorithm saves the redundant power, meanwhile,the motor can adapt itself automatically to work with camera of different weights, no need for parameter setting. There are nine 1/4 inch thread interfaces could be compatible with all external accessories with1/4 thread such as tripod,It could be also compatible with cold shoe mount adapter with LED fill light / flash light/soft light and other lightings. Flexible light supplement and broaden scene application of low light. 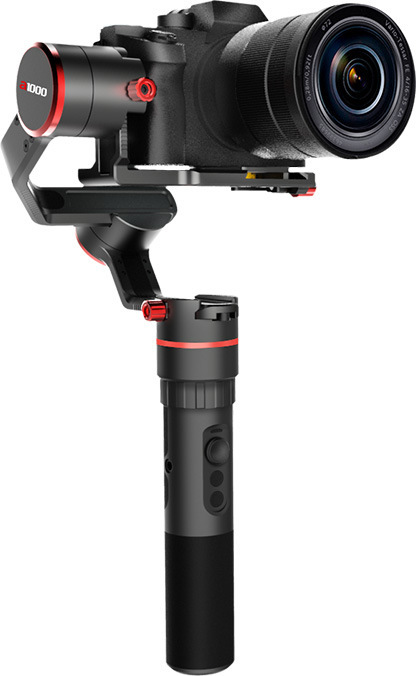 a series gimbals come with 2 pcs of Li-ion batteries:18650, with longer battery endurance, and its working time is up to 12 hours in ideal condition.